The changes below include the changes for 2.7.1 and are marked as such. NEW: Espionage can now import sparseimages and sparsebundles, converting them to folders. NEW: Espionage now prevents the symlink from being moved, deleted or renamed when a folder is unlocked. IMPROVED: Espionage will try to unlock a folder a second time upon failing the first time to compensate for a bug in OS X. IMPROVED: Added helpful troubleshooting tips to some dialogs. IMPROVED: Check to make sure there’s enough space on the drive before encrypting a folder. FIXED: Registration issue with licenses having ‘+’ in their email. If you have a sparsebundle or sparseimage with existing data encrypted in it, you can now turn it into an encrypted folder in a snap. 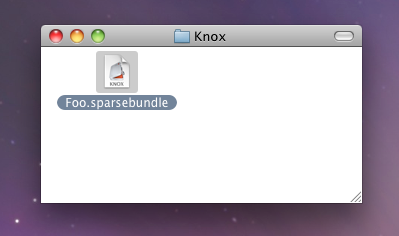 By the way, if you’re a Knox user considering making the switch, you can now get a large discount on Espionage! Just see its homepage for details. 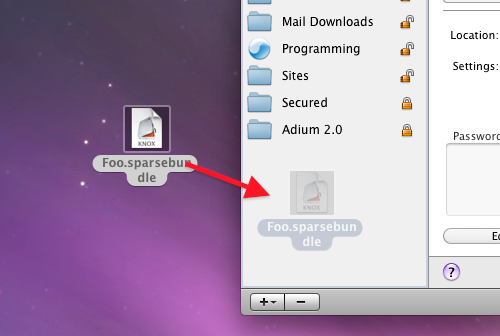 Previously the “Lock Folder” contextual menu did not lock non-encrypted password-protected folders on Snow Leopard. Now, not only does it do that, but you can use it to send folders that aren’t already under Espionage’s protection to Espionage.